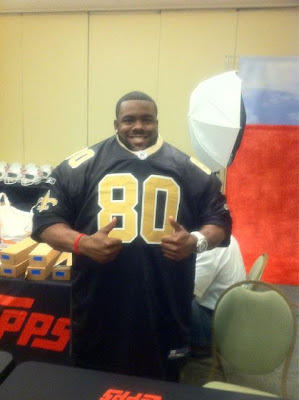 In case you missed it last week, highly touted New Orleans Saints draft pick, Mark Ingram, tweeted this nugget and accompanying photo from the Topps table at the NFL Rookie Premiere: "Haha I'm at the #rookiepremiere and I have on like 17 saint jerseys LMBO!" Yeah, real f@%#ing funny. I REALLY hope he was exaggerating by like 16 but unfortunately I doubt that's the case. Even if it's only 8 or 6 or 4 it's way too many. I mean technically doesn't the material need to come in contact with the athlete themselves to be considered event used anyway? Apparently not. I have long though that a rookie's second most valuable card to their first base RC auto should be their first game used memorabilia cards issued their sophomore season because at that point the manufacturers will have had time to acquire legitimate rookie year used material. However, this recent stunt obviously isn't an isolated incident but sadly standard operating procedure and makes you wonder if any non-veteran relic card is EVER game used? WTF are they going to do with 340,000 jersey swatches? Sadly we know the answer and I better NEVER, EVER, EVER pull an Ingram card that says "Game Used" on the back. 20,000 memorabilia cards?!?!?! Shouldn't that be enough for an entire year's worth of product?!?!?! So what are the other "16" jerseys for?!?!? Memorabilia/relic cards still have their place in The Hobby, but this is NOT it. This is exactly why the majority of these cards can't be sold for $.99c and are literally worthless. I mean really, why bother? The thought that somebody told him he had to put on all those jerseys so they could be officially called "Event Worn" is pathetic and no wonder Ingram started his Tweet off with a laugh . . . at us the collector, probably. Wouldn't it be less embarrassing for everyone to just put the jerseys on a table and have the athlete lay a hand on them and breath on them ,thus anointing them as "Event Used"? Or wait, why not just leave them in a big box, bring it to the event, leave them in the box and set a lamp on the box and then you could still call them "Event Used"
I'm sure Topps wasn't too happy with Mark Ingram but as a collector, I am disgusted by this practice and I am tired of constantly feeling that the manufacturers are always trying to "get one by us". The last time I checked, jerseys weren't supposed to be the length of an evening gown either. and really? couldn't they at least be his jerseys? Ingram is an RB, and by league rules, RB's cannot wear the number 80. 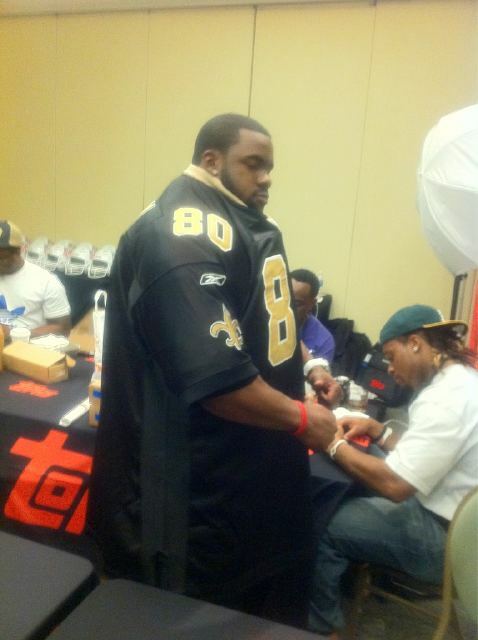 To be fair, there's a reason why football jerseys are made that long; so they can fit over all the pads that are worn underneath. However, the sleeves on an actual "game-used" jersey are nowhere near that long. I think your number might be a bit off. In order to yield 20,000 one-inch squares, it would need to be 138 square feet, which is pretty darn big. 2,000 one-inch squares sounds more likely, which would give you 13 square feet, which I can see a football uniform being. It's funny that you posted about this... because my next "cardfoolery" post was based on "event used" cards. This isn't the first time I've heard about players throwing a jersey on and then quickly removing it... and then repeating the process with another jersey. But it's definitely the first time I've heard of a player slapping on 16 jerseys. "Event worn" memorabilia cards are garbage and a waste of a jersey. A lot of collectors already agree... and it's only a matter of time before they become fillers. I personally would rather receive a nicely designed "manufactured patch", instead of these. Anyways... great post... if enough of us spread this message, maybe Topps & other card companies will finally do something about it. Before I even got to the comments, I was thinking what Capt. said. #80 for a running back is just silly. That being said, Event Worn needs to go. Period. May want to correct your #'s...Anon poster is right. No where near 20,000 1x1's in one jersey. Yeah, there is definately way too many jersey cards. Dealers have a hard time selling these cards, let alone the regular cards. And nobody wants a jersey card of an unpopular player or scrub. It would not be so bad if jersey cards went away for a awhile, like ten years. The cost of boxes and packs would actually be cheaper without the jersey cards. I would actually like to see hologram cards make a come back. I always liked hologram cards. Is it too soon to see hologram cards back again? I think not. I love your jersey and not to mention, I love number 8 as well. I've been saying any event-used jerseys are worthless since they first appeared in the hobby in 2001. What's worse is that Upper Deck has been using NOTHING BUT "player worn for Upper Deck" jerseys in football since 2010 (which means maybe the athlete threw it on at home for 2-seconds, MAYBE THEY DIDN'T - WHO KNOWS???) and no one publically ever mentioned a word about this but me. WHY??? Have collectors been so controlled like sheep (by card companies & WORTHLESS price guides like Beckett) that they no longer bother complaining to the RIGHT PEOPLE at all anymore? If this is the case (and I think it is) then only collectors are to blame!!! Card companies get 2,000-2,500 1X1 swatches per jersey. VOTC said the number was 20,000 from another "mfg" source, well sorry, but they were TOTALLY WRONG. I was the Senior Manager of Customer Service at Playoff in 2001 to bust them for all kinds of fraud (which I finally did by 2009). During my first week at Grand Prairie, TX- I got stuck sharing an office with the girls who cut the jerseys by hand and they all said football jerseys yield 2000-2500 1X1 swatches (like for 2001 Leaf Certified GU cards) depending on the size of the jersey. I also have the actual zip-lock bags Playoff used to hold baseball game-used hat & glove pieces so I know exactly how many pieces these items yielded as well. WHEN WAS THE LAST TIME ANYONE GOT TO ANY CARD COMPANY EXECUTIVE AND ASKED FOR A LETTER OF AUTHENTICITY THAT COMES WITH EVERY REAL GAME-USED ITEM? I'm asking this because I'm terminally ill and very, very sick every day- so I cannot do this stuff anymore. WHEN I ASKED THIS OF PACIFIC IN 2001, EVERY ONE OF THE SIX EXECUTIVES I SPOKE TO ON THE PHONE (and tape recorded) REFUSED TO SEND ME COPIES. WHEN I REPORTED THIS TO THE MLBPA, THEY COULDN'T GET COPIES EITHER BECAUSE PACIFIC HAD NO LOA'S! THEY WERE USING ONLY BRAND NEW STORE BOIUGHT JERSEYS AND WERE PASSING THEM OFF AS GAME-USED. I caused Pacific to lose their baseball license less than a month after I notified the MLBPA of my evidence! How does anyone know that any card company over the last TEN YEARS is using REAL game-used jerseys unless you've seen copies of Letters Of Authenticity? Stick to cards YOU OWN and you have every right to ask for- and see copies of these Letters Of Authenticity! Once the current TRUTH is exposed, I think game-used cards will finally be gone for good!